I like electric clocks. They're as accurate as the 60 Hz they run on and it's easy to tell the cumulative duration of power outages in a given interval. The ticking of the second hand on quartz clocks is annoying to me; the second hand is supposed to sweep, reflecting the continuous nature of incremental time passage. 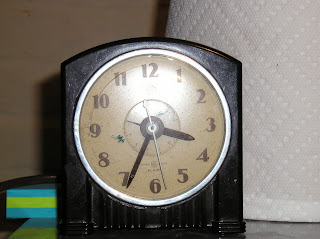 IIRC from researching this model, it was made around 1947. Now it lives in the White Audio shop where looking at it makes me happy. The second task at Lincoln Berean was a little cleaning on their 48-channel GL4k. Currently it lives at Monitor World and is about to be tasked with mixing a few more in-ear monitors and a few less wedges. 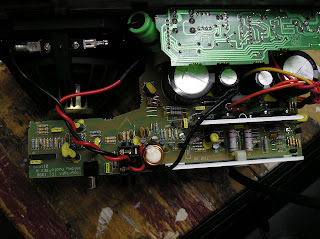 Work done on this was some cleaning of the open-frame group master faders and re-wetting of a few LED solder joints. Replacement LEDs are on the way for the permanently dark ones. 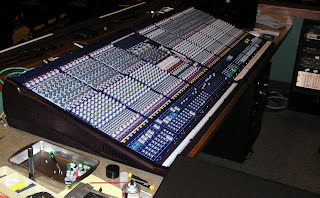 Incidentally, I've done quite a bit of mixing on this console in its previous life as front-of-house in the old "big" room at Berean, now named "The Chapel" though it still seats 750 (the new room is 2000+). Many weddings and a few live-in-concert albums for Simple Grace, a gospel/bluegrass-singing family. Also one year's Easter drama production where the programmable mute scenes came in handy (though the manual override was essential when the actors got off script...). 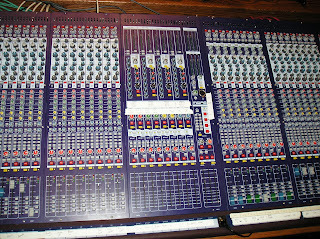 IIRC this mixer was the first large format console at the church after the obligatory Mackie 24x4 which still won't die. 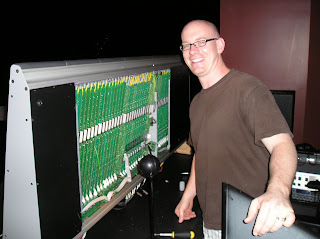 Because it's the FOH console at Lincoln Berean and inconvenient to take out of service, this was an in situ repair. Aux busses 7 and 8 were reportedly intermittent and hence banned from use (see the "X"s in the second pic). With the help of Corey Simmons, the head system tech, the trusty $1 Discman-turned-signal-generator was patched into the first 32 channels or so to track down the origin. Amazingly Aux 8 was actually observed to work fine and be low in level with a high-pass. 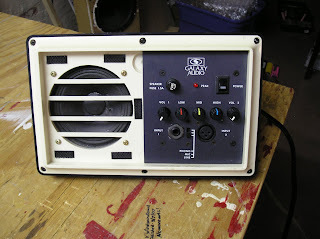 It had the characteristic sound and EQ of a barely-made connection in a ribbon cable somewhere. The right side never exhibited an issue through the testing while the whole left bank of channels would come in and out. Thus, the first place to check was the connections from the master section to the left. Now, usually such a ribbon cable search involves tipping the whole mixer up 90 degrees, pulling the bottom panel, and a good measure of educated guessing. 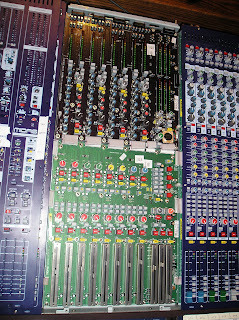 Midas, however, made this console so the top steel panels could be removed from above without needing to remove anything other than a few screws and fader caps. All the rotary pots come through holes a bit larger than the knobs and therefore do not need removing. Apparently the original installer needed to open it up for a headphone amp issue and was told (after destroying a few) there's a special tool to unseat the ribbon connectors. This is the only Midas in town I'm aware of, so obtaining the tool wouldn't yet be in White Audio's best interest. With the gauntlet thrown, I went to work on the aux bus ribbon connectors with a few flat-blade jewelers' screwdrivers and small pliers and removed them. My guess is the tool has tabs which open the locking tabs on either side and grip to allow parallel extraction, similar in idea to the tool for extracting after-marked car stereos. The connector positions are spade-type with a pinching female side. Perfect candidates for a bit of oxidation and lessening pinching force to create intermittent and high-resistance connections. Symptoms I've seen with this setup are of the "It works for a few minutes/hours and then it just goes away" type due to changing temperatures from being powered on. Testing after putting it back together gave the all-clear. The real test will be for the next Saturday/Sunday services since intermittents only fail at critical times.. These two small powered monitors are in service at the keyboards at Hillcrest E-Free Church in Seward NE. Each have two inputs and are gain-staged to accept instrument- and mic-level signals. 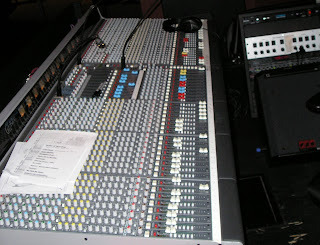 However, they're actually fed the line-level outputs from the keyboards, with the second input coming from the mixer in a music-plus-one monitoring arrangement. Because the input signals are rather hot, all the gain pots are almost closed off completely, giving only a few degrees of rotation between too-loud and off. It was time to do something about it. 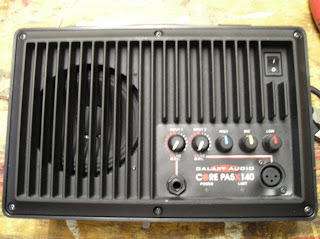 The PA5X140 used a C-law pot with an inverting opamp to get the large gain range needed to handle mic to line-level inputs. One end is the input, the wiper is connected to the inverting input, and the other end is connected to the opamp output. 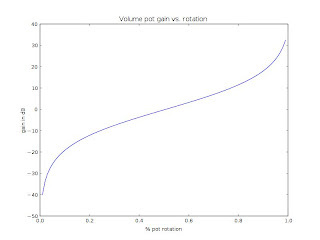 Plotted is the gain-versus-rotation of the stage using a linear pot. 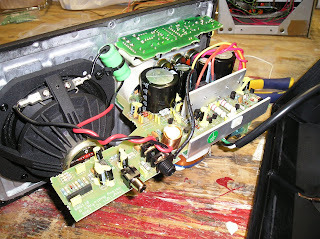 The easy solution was merely to adjust the gain of the power amp from 38 dB down to 18 dB, effectively raising the as-used pot position from 5% to about 30% rotation. With only a single resistor change (next to the 1/4in TS jack), un-modding this unit will be trivial if needed in the future. The beige-faced Hot Spot is, I believe, an ancient PA3. Even the schematic provided from Galaxy had little in common with the actual PCB. Volume control for the vintage model was the normal attenuator with make-up gain. The smoking gun, though, was the pot marking "104KA" -- a 100k linear pot. Volume controls "feel" best with an exponential R-vs-rotation slope to be linear in dB. Quick mod #2 was adding a shunt resistor of 10k from wiper to ground to fake loggify. Rod Elliott of Elliott Sound Products calls this A Better Volume Control.